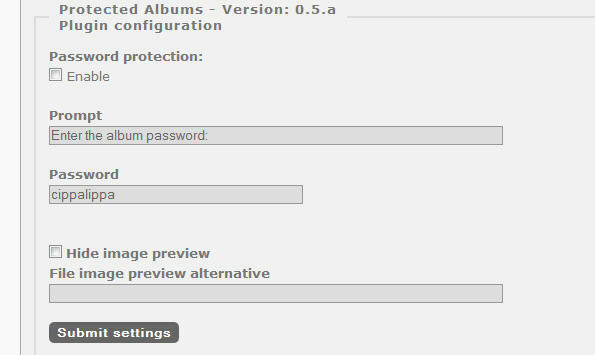 About: This plugin allows you to password protect an album. It has been written for photographers to publish images from an event, a wedding for instance, and require a password to be entered to view the images. It does not require users to register or login. IMPORTANT: This limitation is removed!! Cheked with version 2.9: Is OK! Updated to achieve compatibility with Piwigo 2.7.4. - Updated to achieve compatibility with Piwigo 2.4. No longer works properly with Piwigo 2.3.x and earlier! - Updated to fix bug when QUERY_STRING is not in environment. Fixed by mistic100, thank you! Fixed compatibility with sub albums. Now inherits password from parent albums or can be overridden at the sub album. Improved invalid login error message. Added plugin url so versions can be checked.